An all-girls education doesn’t just take place in the classroom – it’s BEYOND THE CLASSROOM that makes the experience extraordinary. We can tailor everything from online coursework to career exploration to academic competitions towards the special interests of girls. We help girls focus their academic and extra-curricular energy toward exploring a career path. We bring in speakers who are female leaders in their fields so that girls know that nothing is beyond their reach. Girls hold every position on champion academic teams like Mock Trial, Model United Nations and Robotics. And we provide small, all-girls classes online to ensure students with highly focused academic goals can customize their learning experiences. High school girls spend a lot of time committed to extra-curricular activities, clubs, volunteer jobs, internships and elective courses. Why not channel their efforts to give them exposure to college majors and careers that are exciting, rewarding and in need of women? Explore Louisville's Focus Program in Journalism and Media, Law and Social Justice, the Arts, and STEM (Science, Technology, Engineering and Mathematics). Louisville is a Charter Affiliate School with the Online School for Girls, allowing us to expand our course offerings while remaining focused on our mission. Louisville provides a high-quality online educational experience that is not only designed for girls, but is fast becoming an essential part of the highest quality high school education. Small, all-girls online courses taught by the best teachers help provide highly specialized electives for students in our Focus Programs. Louisville supports a variety of academic teams including Mock Trial, Model United Nations, and Robotics. 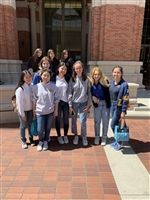 Our all-girls teams do exceptionally well in competitions, with our Mock Trial team ten-time Los Angeles County Senior Division Champions. Students in Louisville's Focus Program participate in academic teams and clubs in alignment with their selected program. Each year there is an exciting and thought-provoking lineup of guest speakers that visit Louisville with the goal of exposing students to other cultures, global issues, environmental challenges and teen physical and emotional health issues.